Το BEST Πάτρας είναι ένας από τους πιο εντυπωσιακά οργανωμένους πανευρωπαϊκούς συλλόγους φοιτητών. Ο σύλλογος είναι μη κερδοσκοπικός, μη πολιτικός και εθελοντικός οργανισμός με μέλη 64 πανεπιστήμια της Ευρώπης. This entry was posted in Computers, Conferences, Events, Free software, FreeBSD, GNU/Linux, Linux, Open source, Software and tagged Computers, Conferences, Events, Free software, FreeBSD, GNU/Linux, hellug, Linux, Open source, Software on 2009-05-25 by keramida. This entry was posted in Computers, Conferences, Events, Free software, FreeBSD, FreeBSD committers, FreeBSD people, GNU/Linux, Linux, Open source, Software, Windows and tagged Computers, Conferences, Events, Free software, FreeBSD, FreeBSD committers, FreeBSD people, GNU/Linux, hellug, Linux, Open source, Software, Windows on 2008-10-18 by keramida. Everything is ready, so I’m going to leave for Athens to attend the “Athens Digital Week 2008” event tomorrow. Two short presentations have been prepared, and sent to the organizers. I am not sure if we will have a lot of time to present both of them, but we can definitely try. What is absolutely amazing though is that two out of three of the current Greek FreeBSD Committer population are going to be there. Manolis is probably too far to reach us in time for the event, but prof. Diomidis Spinellis and me will be there. Yay! This entry was posted in Computers, Conferences, Events, Free software, FreeBSD, FreeBSD committers, Fun, Open source, Software and tagged Computers, Conferences, Events, Free software, FreeBSD, FreeBSD committers, Fun, hellug, Open source, Software on 2008-10-15 by keramida. This entry was posted in Computers, Conferences, Events, Free software, FreeBSD, FreeBSD committers, FreeBSD people, NetBSD, Open source, OpenBSD, Programming, Software, Subversion and tagged Computers, Conferences, Events, Free software, FreeBSD, FreeBSD committers, FreeBSD people, hellug, NetBSD, Open source, OpenBSD, Programming, Software, Subversion on 2008-08-20 by keramida. 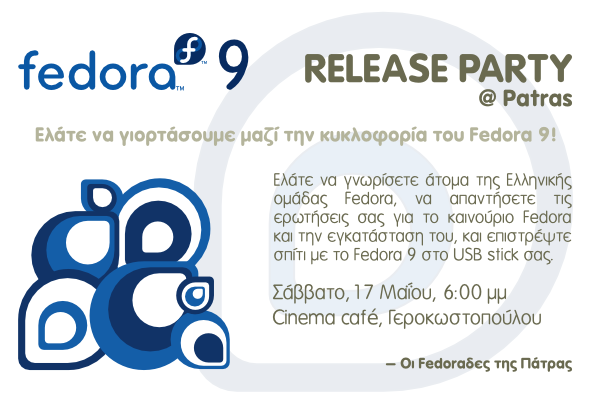 Dimitris and his Fedora friends are organizing a release party for Fedora 9 today (Saturday, May 17 2008). This entry was posted in Computers, Events, Free software, FreeBSD, Fun, GNU/Linux, Linux, Open source, Programming, Software and tagged Computers, Events, Free software, FreeBSD, Fun, GNU/Linux, hellug, Linux, Open source, Programming, Software on 2008-05-17 by keramida. As I promised at Last afternoon’s post from the FOSSCOMM presentation room, here’s a short write up of the , relatively short, but good times we had in NTUA this weekend. This entry was posted in Computers, Conferences, Events, Free software, FreeBSD, GNU/Linux, LaTeX, Linux, Open source and tagged Computers, Conferences, Events, Free software, FreeBSD, GNU/Linux, hellug, LaTeX, Linux, Open source on 2008-03-23 by keramida. This entry was posted in Computers, Conferences, Events and tagged Computers, Conferences, Events, hellug on 2008-03-13 by keramida.